Twheel is a new client of Twitter for iOS of Fluid Interaction of Finland, firm will soon launch a version of this app for Android. This is a totally different client to all the known until now. Instead of columns, tweets are seen in a wheel that tells us RT’s by a white lines and so in this way we can see what are the most important or those that the people share more. When you click on one of the tweets, it automatically opens a wheel of actions, where we can send direct message, retweet, bookmark, view information about the author’s bio and other actions. It is very intuitive and helps to visualize the relevance of the tweets of our stream. 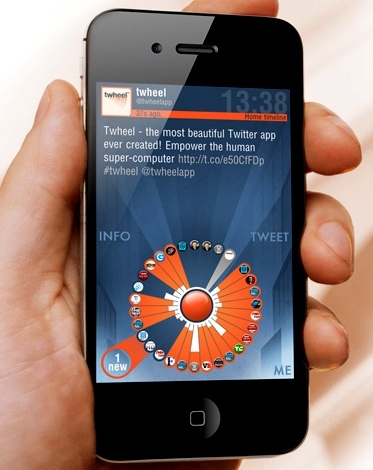 We agree that Twitter generates a lot of noise, many tweets, and more than half do not say anything, do not leave us nothing, this is where Twheel helps us to show the most relevant for us.